On the opening day, a massive rally was held with people from all over Punjab converging at the village. 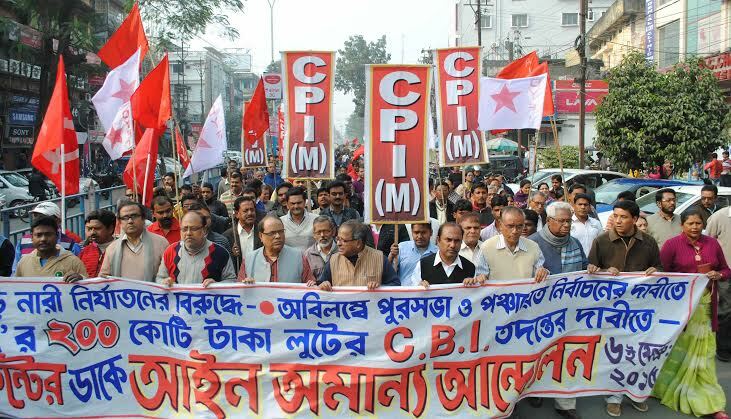 The rally was addressed by Prakash Karat, General Secretary, S.Ramachandran Pillai, Member, Polit Bureau, Nilotpal Basu and Joginder Sharma, members of the Central Secretariat addressed the rally in addition to State Secretary, Charan Singh Virdi , and State Secretariat Members Raghunath Singh and Vijay Misra. Earlier Gurchetan Singh Bassi, Chairman , Reception Committee welcomed the leaders and people who came from all over Punjab to the attend rally. 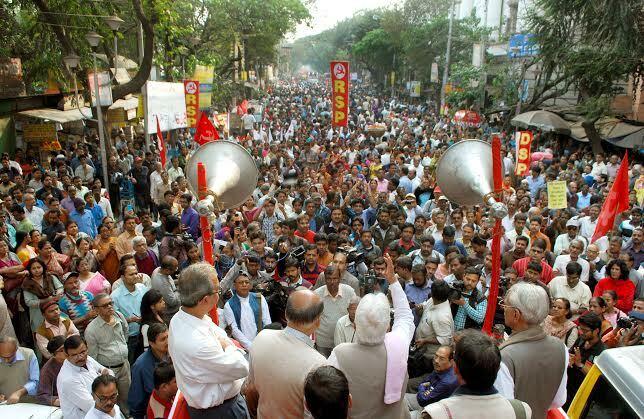 While addressing the rally Karat said that much publicized “Acche Din” of Narendra Modi have not come for the masses of the country but for the corporate houses of India and foreign big companies. The capital of tycoon Gautam Adani has increased by Rs.25,000 crores in seven months. During these seven months nine ordinances including FDI in Insurance sector amending labour laws, amendment to land acquisition act etc. have been issued because the BJP is unable to face the Parliament. The BJP is claiming that they have got absolute majority and support of the people of the India whereas they got just 31% votes of the people, he said. Commenting on the visit of President Obama on the Republic Day, he said that it is a sad day for us that a person who has taken away the sovereignty of many a countries will be our guest on such a pious day. He lambasted the BJP for following the dictates of RSS, which is spreading communalism all over the country and trying to establish the Hindu Raj at the cost of the minorities. He expressed his great concern over forceful religious conversion. 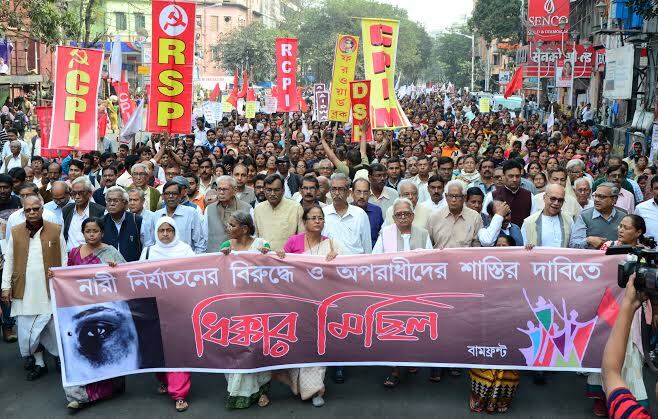 He declared that CPI(M ) is preparing for a serious struggle against the anti-people, anti-workers, anti-peasant policies of the Modi Goverment. He said that the valiant strike by 7 lakh workers of Coal India is an example for the working class of the whole country. 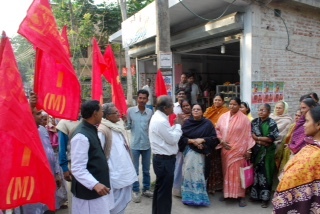 Apprehending big attacks on workers and farmers, Com.Karat called upon the working people to unite to face these attacks. Gurmit Singh Dhadda, Secretary Reception Committee thanked the leaders, guests and people for making the rally a grand success. Later, Com. Gurchetan Singh Bassi, Chairman Reception Committee welcomed the central leaders, state leaders and delegates to the historic land of freedom fighters, Gadhri Babas and martyrs. Com. 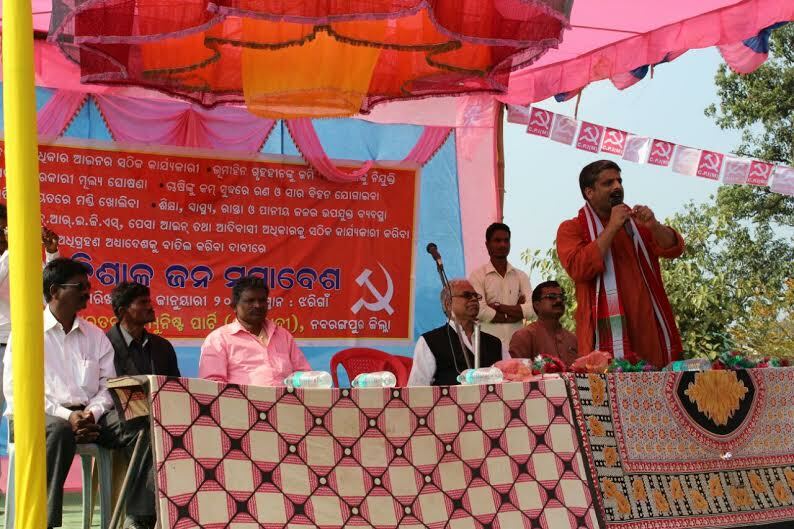 Praksh Karat, inaugurated the Conference in the Com. Sarwan Singh Cheema Hall at Com. Harkishan Singh Surjit Nagar. Analysing the international situation, Com. 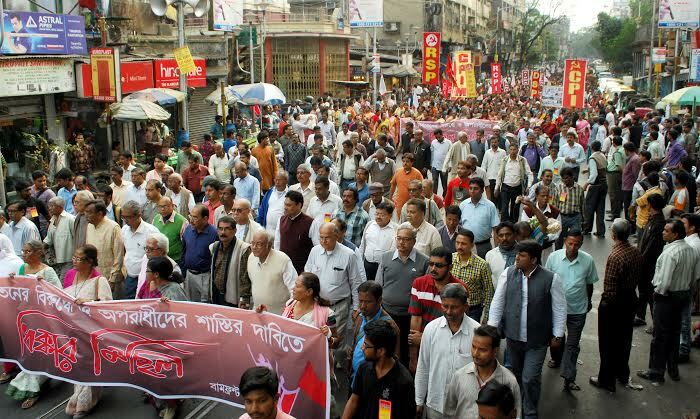 Karat said that the European nations have still not recovered from the economic and financial crisis of 2008 and the working people are under attack through wage cuts, job cuts and withdrawal of many social expenditures through austerity measures. He alleged that US led NATO attacks on Iraq and Libya have replaced secular governments by Islamic Fundamentalists, and the same situation is being created in Syria. He expressed serious concern over the increasingly offensive posture of US imperialism, especially vis a vis China. Com. Karat said that in Latin American countries left forces are getting strengthened and have rejected the neo-liberal policies. Commenting on the national situation, Com. Karat said that after the formation of Modi lead BJP Govt. 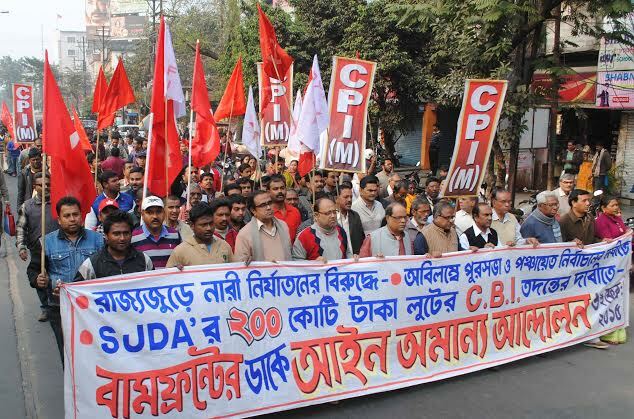 the working people are under twin attacks – right wing economic attack of corporate sector and attack of Hindutava by RSS and its affiliates. He said that economic policies are being implemented through ordinances. He expressed serious concern over the way in which RSS is penetrating in Education, Arts & Culture and other departments. 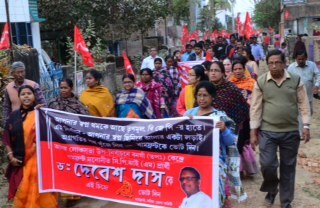 He condemned the Hidutava, fundamentalist forces for dividing the society in the name of Love Jihad, Gau hatya, forcible religious conversion and targeting of Bangla Deshi immigrants. Com. 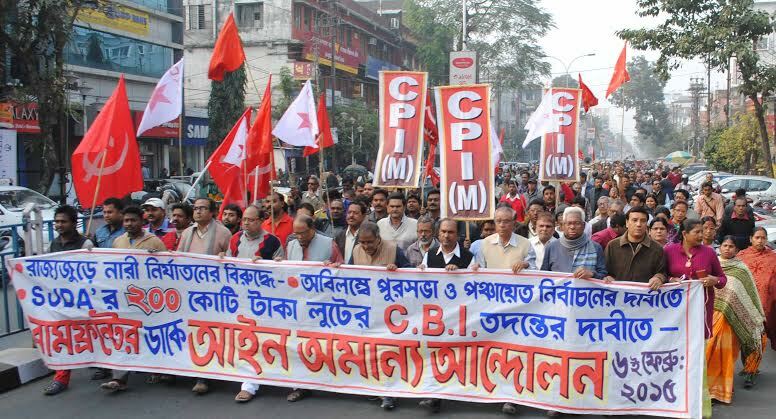 Karat emphasised that CPI (M) has the primary responsibility to organise struggles against both the attacks stressing that parties like the Congress and regional parties cannot do it. Com. Charan Singh Virdi, State Secretary presented the report of activities of the party since the last conference.